When you hear the word ‘audit’ you probably think of financial auditing. But literally any process or department within a business can be audited. From safety, security, compliance and internal controls, to quality management, project management, water management, and energy conservation, third party auditors can assess the effectiveness and efficiency of incredibly important aspects of any business, no matter its shape or size. And it’s not just the private sector that benefits from auditing; government agencies and nonprofit organisations both utilise performance audits, examining their success in delivering mission objectives. In this blog post, we’d like to discuss just how ApprovalMax supports the day-to-day role of an external auditor. The importance of conducting an audit cannot be understated. The results provide a business’s stakeholders with the opportunity to evaluate and mitigate risk, improve internal controls, and review corporate governance. An external auditor’s job, therefore, is to provide a professional and objective assessment on the area of the business being audited. They must determine if the department or internal process is free of errors, inefficiencies, or fraudulent activity, and is compliant with corporate and government regulations. To facilitate the quick, efficient, and reliable collection, evaluation and analysis of data and compliance, auditors require access to a system that gathers the necessary information and clearly defines the formal approval process. How the approval processes are defined by the organisation. How the approval processes are actually executed. Approval Matrix defines approval steps and authorisation levels. For the compliance evaluation of approval processes with regard to how they have been defined by the organisation, ApprovalMax provides executable workflows that can be set in an intuitive graphical form with visual presentation of the approval steps as configured in the system. 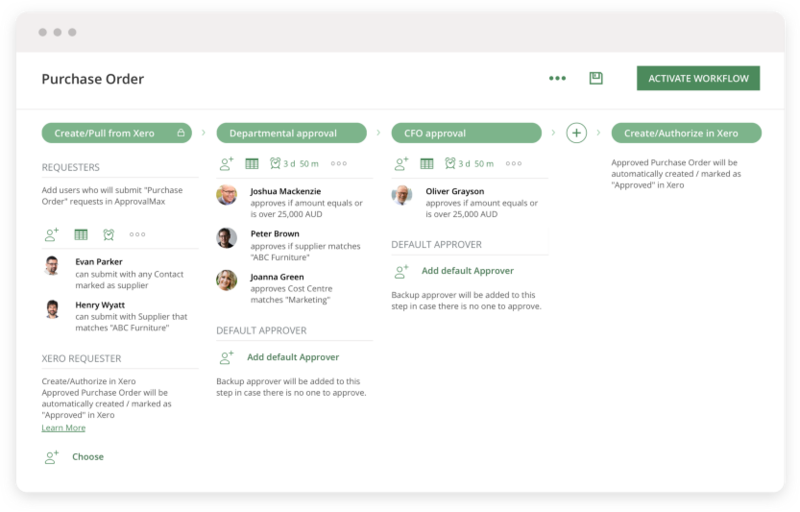 Also, ApprovalMax provides an approval matrix for defining Approver roles and approval routing based on conditional parameters, such as monetary thresholds, cost categories, project codes, and so on. This supports a quick and informed judgement regarding the compliance of the configured approval roles with the required level of authorisation. Together, these two capabilities enable a real-time view on how the company’s approval processes have been set up. For specific pre-defined process types such as purchasing processes, the Requester matrix allows to easily view and configure the settings for Purchase Order Requesters as well as defining Requester roles and request parameters, e.g. by amount, cost category, etc. For the compliance evaluation of approval processes with regard to how they have been executed, ApprovalMax provides comprehensive reporting. Various searchable reports provide a complete picture of how actual approvals have been performed, allowing to have both a good aggregated view and the ability to easily drill down to see any low-level details needed to perform the analysis. Such reports can be downloaded in the Excel format. These reports aid, for example, the detection of exceptions to the approval process, such as delegated approvals, auto-approved approvals, non-completed approval requests, forced approval decisions (usually indicating approvals performed by an Admin instead of the designated Approver). History logs are provided for each approval, including the names of Approvers, dates of approvals, comments to approvals, etc. Audit reports are provided as a summary of all approval steps and approval details as normally requested by auditors. Audit reports come in a PDF file and can be accessed in both ApprovalMax and Xero. The powerful features of ApprovalMax allow auditors to easily and comprehensively analyse a company’s approval process when it’s subject to financial audit. Business critical processes are fully visible and traceable. Process efficiency and team productivity both increase thanks to minimal manual intervention and the cutting of paper trails. History logs and reports provide increased data and process accuracy, resulting in informed and useful judgements. External auditors can help spot inefficiencies, errors, or fraudulent activity, therefore greatly improving a process, department, or business. And they deserve the best tools available to help them carry out this most important of tasks. ApprovalMax’s capabilities support faster and more accurate audits, with recommendations grounded in observable facts. If you’d like to find out more about ApprovalMax and its other capabilities, click here. Or if you’d like to try it out, sign up for your no-risk 30 day free trial here.